THOSE DANCING DAYS - IN THEIR OWN SPACE SUITS ! Last Saturday i had the chance to see the perform of these five young – very young – women from Sweden. Usually I don’t do gig reviews at my blog but since I chatted a little with them after the show here’s the result and my opinion. First, the venue , the majestic Theatro Circo from Braga with it’s excellence and professionalism from their workers. They always brought to us new values in terms of music even if the final cash return is not 100% granted. But this is another story. Second, the sensation that they saw one excellent performance from five teenagers with a dozen of musics to play (in the encore they said “we played all are musics”) with a excellent live vibe and visible enthusiasm. Besides Linnea the singer, Lisa from the keyboards takes the control of the dancing and the apparent semi-madness. Cissi, on the drums disguises her age with the will to bit the drum-kit. Mimmi, like her instrument, she’s the quiet one, while Rebecka on the guitar is the most talking “TTD”. Sure they are a little bit “green” but, the warning is here. For those who have space in the line-up’s to the Summer festivals, they sure grant a excellent one hour show at the end of the afternoon. Move fast. The gig was quick, about one hour. The audience continuously asked for “Action Man” but the ladies gave us another “Hitten” with an excellent performance by Linnea. Since the day before i was chatting with Peter Morén (Peter,Bjorn & John) I told the ladies that he asked me to say “Hi”! I said it! Q: What’s the reason for the album title “In our space hero suits”? R: Basically, we fell that when on stage, we do the best of our best so it’s like he have a super hero suit on, you know? Q: What were/are your biggest influences ? R: Linnea e Lisa – Several, nothing specific. Rebecca – “Typical Girl” ? (I really don’t know what Rebecca meant). "CRISIS" ISAAK - The best medication to face it ! Are we in Crisis? Yes, we are and there’s plenty of them! Since it’s Easter time I, sinner, confess myself: I do appreciate this gentleman’s whom I’m speaking next. I’m sure, although some will deny (Oh Judas!!) that men, women, young, old, hetero, metro, by’s, gays, lesbians and so on melted tear or equivalent when listening to Chris Melodies. It’s part of our nature. “Wicked Game” was edited 20 years from now. 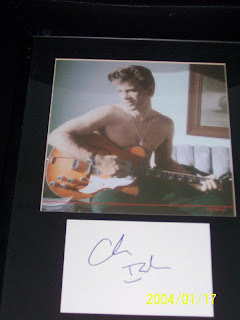 Everyone knows this tune from one at the time almost unknown musician to today’s also actor and host of his own tv-show, Chris Isaak. I remember that I bought this vinyl called “Wicked Game” before being edited around here. It was a mix between one best-off and original tracks since it was Chris fourth studio album. In the following year he became widely known after the soundtrack of David Lynch’s movie “Wild at heart”. Chris doesn’t belong to the musical landscape that usually inhabits my neurons but is in fact a unique performer. Nearly 53 he still has the same vitality and singing capabilities that are his trade mark. He edited recently a new album called “Mr. Lucky” and, i believe the name fits well. I’ve always admired his personality and above all he is a man of principals and as he assure, he likes to take care of his own, a friend. His band, his mates are the same for almost 20 years. I’ve chosen from his last record after the first listening, 3 tunes that although the message is almost the same, they capture all that I’ve told you until now. Pay attention to the third track on the player. In the video bellow, a mini interview where you can watch some stories on Chris background and the delicious tale on how he and his brother “strike” their mother with ballads that from ballads they’d get only the name. To you all a nice Easter.